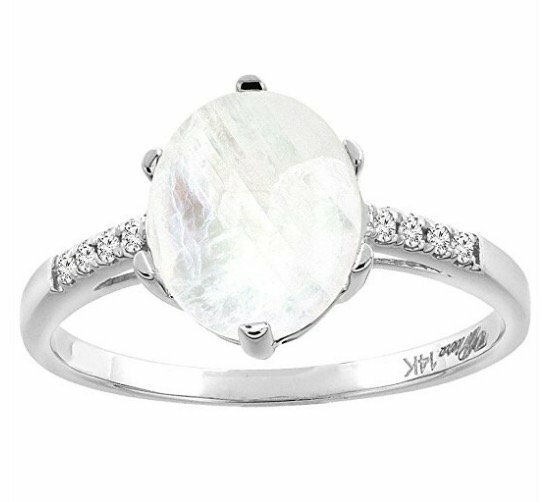 A beautiful moonstone ring can be the perfect engagement ring for a woman who loves the unexpected. 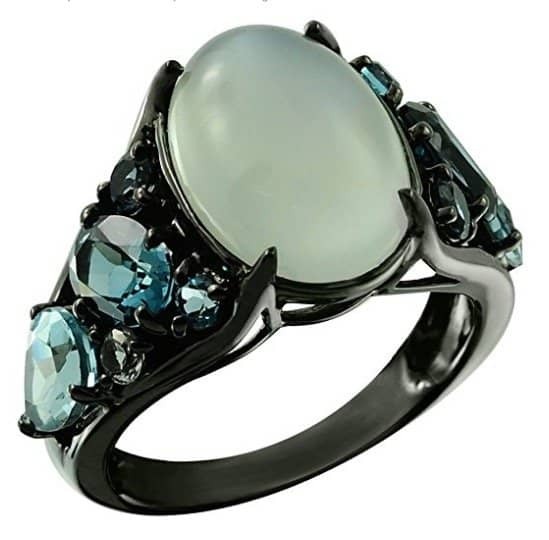 Throughout history, moonstone has been intertwined with love spells and healing properties. Both are wonderful qualities to have in an engagement ring. We had a hard time choosing our favorites since there are so many stunning choices, but these are the ones under 300 dollars that made the cut. Most moonstone rings are oval cut or cabochon shaped, but this is an unusual pear cut moonstone surrounded by a halo of diamonds. The white diamonds are appraised with certification from GIA. They’re natural with a minimum clarity of I1 to I2. The total gem weight of this ring is 0.42 carats. The band is sterling, rhodium plated silver with 925 stamped on the inside of the ring. It comes in sizes 5 to 10. This sterling silver ring with black rhodium plating makes us think of beautiful antique pieces passed down as heirlooms, which is what you might want to do with this beautiful engagement ring. The fine, oval moonstone measures 14 by 10 mm. There are 2 oval 7 by 5 mm London blue topaz and 2 pear shaped 7 by 5 mm round topaz on the sides of the centerpiece moonstone. The total gem weight of all the stones on this ring is 9.98 carats. It measures 22 mm in diameter and 14 mm wide. It’s available in sizes 5 – 10. A 14k white gold rainbow moonstone ring with beautiful diamonds on the band. The diamond accents are natural round diamonds with a minimum color of H-I and a minimum clarity of SI1-SI2. There’s a total of 9 stones on this ring, and the total gem weight is 3.10 carats. The oval-shaped, white rainbow moonstone is heat treated to give it a stunning color. It’s available in half sizes from 5 to 10. The beautiful moonstone in this simple ring is a natural white stone with a minimum clarity of I1-I2. 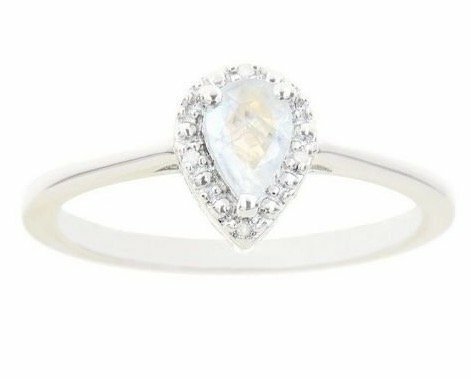 Surrounding the white moonstone is a halo of natural, round cut diamonds with a minimum color of H and a clarity of I1-I2. The band is rhodium-plated sterling silver. The gemstones on this ring aren’t treated. The ring measures 7.6 mm wide and 2.9 mm long. It’s available in sizes 5 to 10. One of the most unique rings on this list. We chose this one because of the recycled metal used in the ring. The ring is made of recycled sterling silver, so you’re reducing the demand for mining silver ore. There’s no loss of quality in recycled sterling silver. 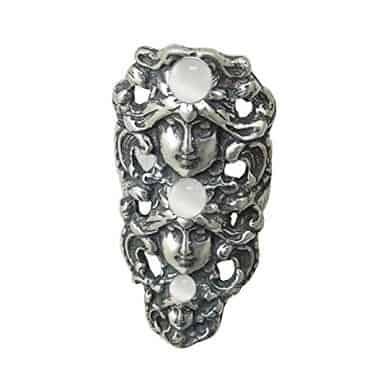 The ring has a gray moonstone surrounded by 6 white moonstones. It’s been created by a certified silver artisan creator. It’s available in sizes 6 to 10. 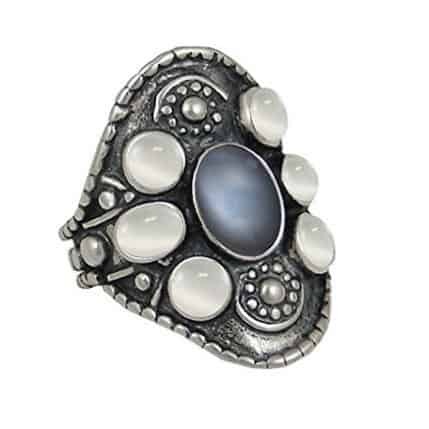 The sterling ring with moonstone and chalcedony is a beautiful ring available in sizes 6 or 7. It’s made of .925 sterling silver and contains three stone in a bezel setting. The sterling is polished to a high sheen to really set off the three stones in the ring itself. If one moonstone is good, three must be spectacular. The metal in this ring is made from reclaimed sterling silver by the same creator of the reclaimed silver ring mentioned previously. Each moonstone rests atop the head of a goddess. The ring comes in sizes 6 to 12. 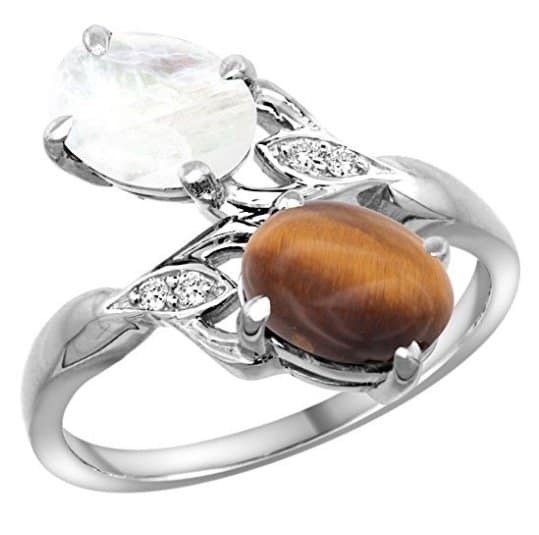 This ring features two large focal gems of tiger eye and moonstone. The tiger eye is oval shaped with a minimum clarity of SI1-SI2. The heat treated stone measures 8 mm in length and 6 mm in width. Set on the opposite side of the tiger eye is a rainbow moonstone with a minimum clarity of SI1-SI2. It measures 8 mm in length and 1.6 mm in width. There are also white diamonds in the ring, which measure 8 mm in length. The diamonds have a color of G-H and a clarity of SI1-SI2. The 14k white gold ring is available in sizes 5 to 10. This sterling silver ring is stamped with .925 on the inside of the ring. 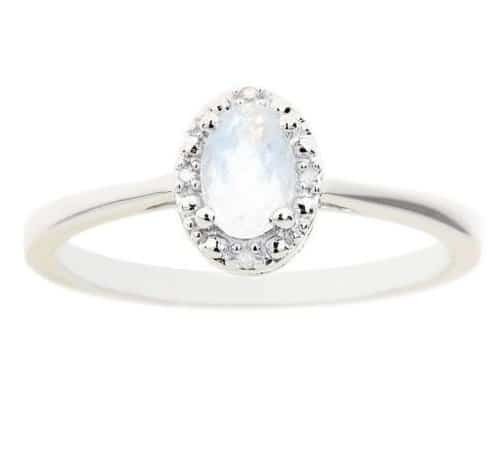 The ring features a round moonstone cabochon of 1 carat that measures 6 mm. 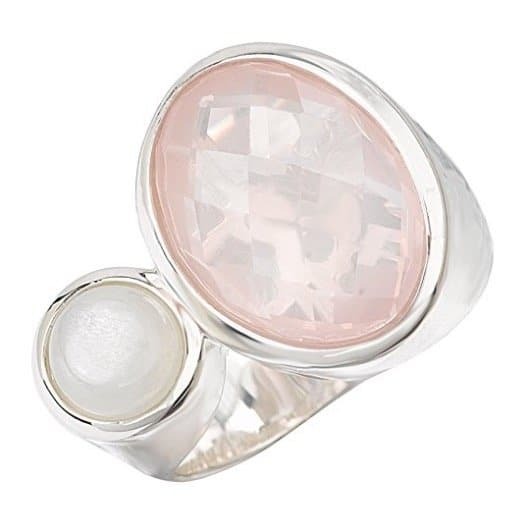 The main stone in the ring is an oval cut rose quartz in a bezel setting measuring 14 by 10 mm. It features a cross-checkerboard facet. It’s available in sizes 6, 7 and 8. This beautiful pastel ring can also be a part of a set that includes a pendant, bracelet and matching earrings. 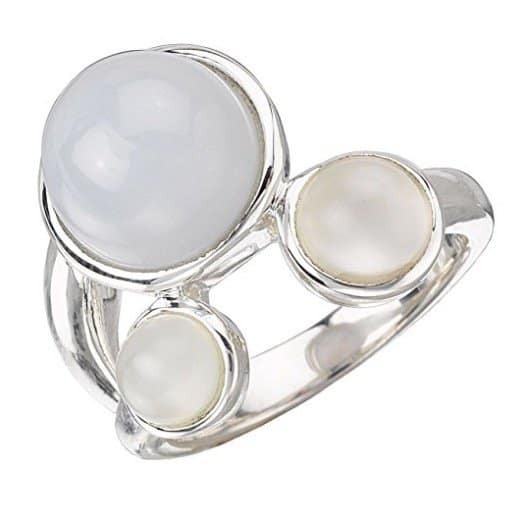 When choosing a moonstone ring, pick one that really speaks to you and matches your personal style. An engagement ring is one that should really encapsulate the love you have for that special someone.